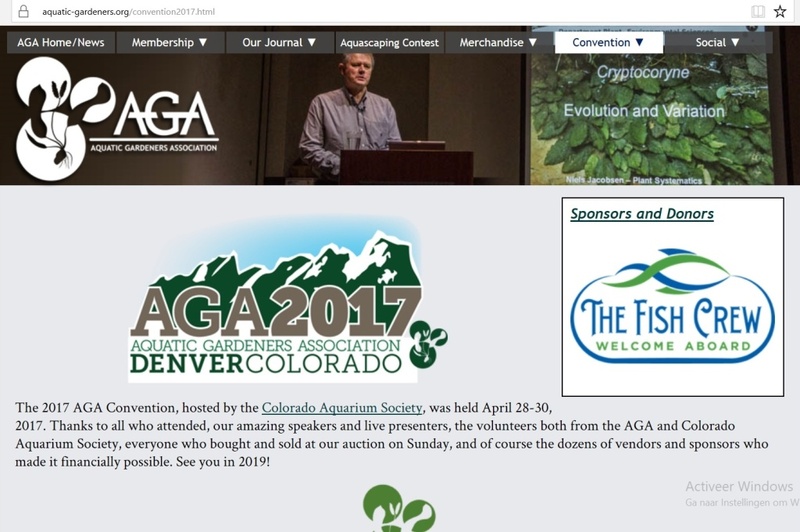 In april 2017 I was invited by the Aquatic Gardeners Association, Inc. = AGA to be a speaker on their convention in Denver (Colorado). After the convention I gave the same presentation, about Dutch Style Aquarium, in San Francisco, Sacramento (both California) and also in Seatttle (Washington). 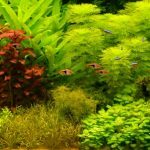 The AGA organizes every year an aquarium photo contest in some categories that concern the size of the tanks in the Style Aquatic Garden (smaller than 28l, 28-60l, 60-120l, 120-200l, 200-320l, and bigger than 320l), and than they have Biotope Aquascape, Paludarium and finally: Dutch Aquascape. 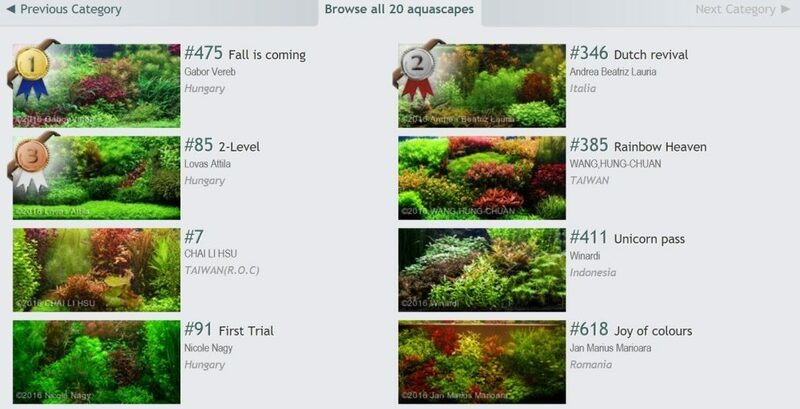 Far most of the participants they have an Aquatic Garden (Nature scape) and there are only a few Dutch Aquascapes. Many of the participants in the Dutch Style category are rejected because their scapes do not meet the Dutch style requirements. The website of AGA, were the info about the convention in Denver stays available. 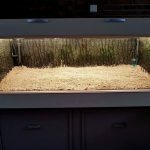 In 2015 I joined the AGA competition and became third with my large Dutch Scape tank. Number 1 was the Dutch champion and number 2 was the Belgian champion. So the third place for me was not a bad result. 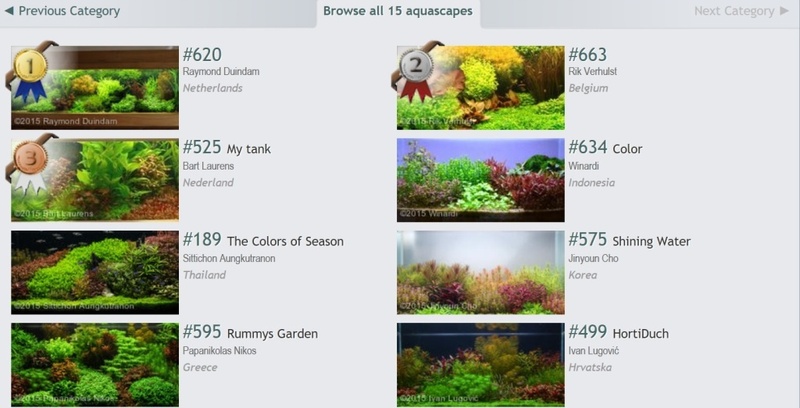 In 2015 I joined the AGA competition and I became third with my large Dutch Scape tank. The winner was Raymond Duyndam, Dutch champion 2015 and second was Rik Verhulst, Belgian champion 2015, both very familiar with the Dutch style. This was the decoration at the time that I joined the AGA contest 2015, Dutch Style. After my tour through the USA I received a lot of questions about Dutch style and that’s the reason why I’m writing this article for my website. 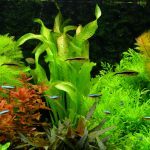 My website provides a lot of information about all kinds of subjects concerning keeping an aquarium, but my website is mainly in Dutch. I have connected a translation program, but only a part of the translations are correct. I try to write this article in English, for my English speaking friends. This is the aquarium of Willem van Wezel. He is always good for a beautifully decorated aquarium Dutch Style. He changes the layout of his aquarium very regularly. 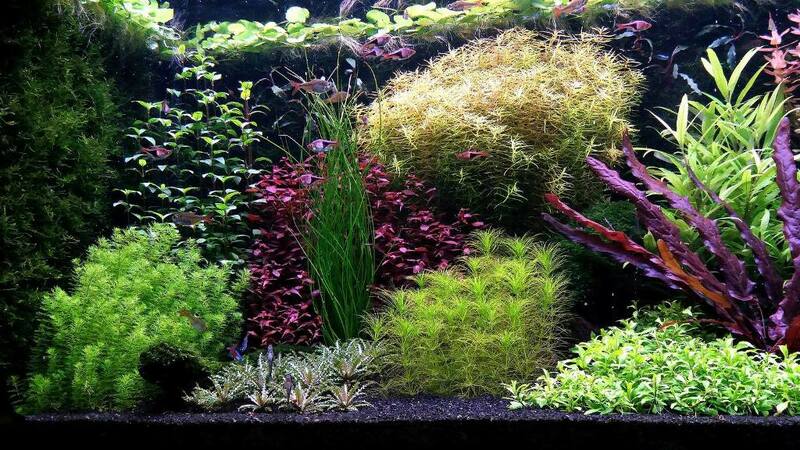 by Aquascaping Love · December 18, 2013. The national Dutch Society for Aquarists is the Nederlandse Bond Aqua Terra, shortened N.B.A.T. In both 2016 and 2017, I forgot to participate in the AGA competition. In 2016 the winner came from Hungary, nr two from Italy and number three also from Hungary. It was clear to see that these three were more remote from the Dutch Style than the winners in 2015. At number one I gave some comments during my presentation in Denver. When evaluating and analyzing an aquarium by a photo, I like to work with lines in that photo. 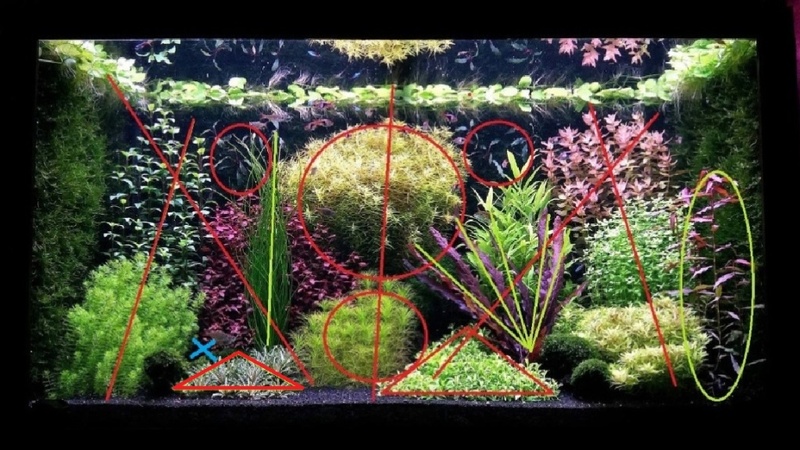 It struck me that the winning tank had the red plant group exactly in the centre and that the blocks and the oblique lines showed a high degree of symmetry. Views to the back wall are completely missing. Although this tank looks nice and healthy, such a tank would never have become number one in The Netherlands. The aquarium of the Dutch national champion 2016 and 2017. Pure Dutch Style. 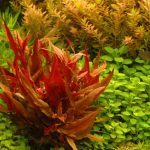 The only remark that I could make is, that the group of Rotala rotundifolia is too much exactly in the middle of the tank and divides it visually into two parts. 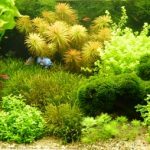 That The Dutch Aquarium style does not allways imply the use of wood, rocks and other hardscape materials, does not mean that they’re not allowed to be used. On the contrary: Making use of a piece of wood or a rock can be very attractive and might improve the decoration of your tank. But it is preferred to choose for only one kind of material: wood or stone, or artificial decorations. If you choose for one of them, you should use only that stuff. If you have chosen for wood, you should use only wood of the same kind, for instance: only Spiderwood, or driftwood or Manzanita. 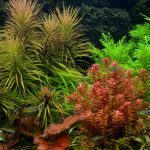 You can use plants from all over the World, but you only should chose species that share the same demands concerning temperature, light , and water quality. 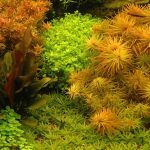 About 60-70 percent of the plants should be all shapes of green and the rest may have other colors, for instant red, or pink, or orange, even yellow. Combine plants with different shapes of the leaves and colors. 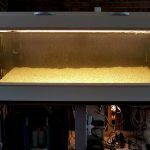 This is Henk Bretveld’s aquarium. He was chairman of the Zoetermeer aquarium association for 30 years. 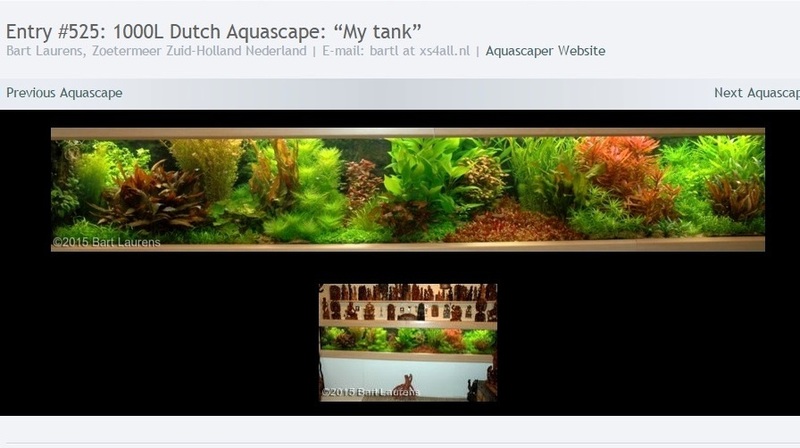 He is also always good for a beautifully decorated aquarium Dutch Style. Henk always uses subtle pieces of wood to create more depth. 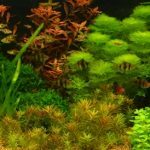 I have a fairly large aquarium and usually about 30 species of plants. To be able to perform well during an inspection by the judge, all those plants must be at the right height. In addition, they must be healthy and have no defects. This means that I have to know all plants very well in terms of their demands and in terms of growth behavior. On this picture the right side of my tank is planted too dense. Their should be some views to the backside of the tank. 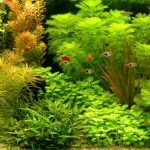 Knowledge of the plants is extremely important to realize a good design of the aquarium. You need to know if a plant is a foreground plant, a middle plant or a background plant. You have to know whether a plant grows quickly or slowly. You need to know whether a plant needs a lot of light or just a little light. 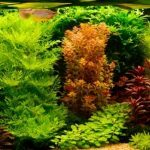 In addition, you also need to know whether the plant already has its submerse shape, or has been grown above water (emerse). Is it a marsh plant or a real waterplant? There is a big difference between a contest on base of a photo and a judge sitting in the room in front of your tank. 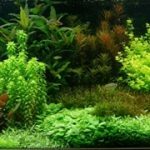 When you send in photo’s, you have a periode of time that you can improve the tank, make several pictures on different moments and you can select the best photos and send them in. If some of the equipment in the tank was not well hidden, you can make another picture from a different angle or you can just hide the equipment behind some mosses or some ferns, just for the picture, or even permanent. But when the judge has an appointment with you on Sunday at 14.00hrs PM, then that’s the moment that your tank should be on it’s best. That means that you have to now the “behavior” of all of your plants. You don’t want de topends to be growing through the surface, they should stay a little bit beneath. You dont’t want the different groups to touch eachother, and you don’t want to see bare stems of plants that grew just a little too quickly. The plants should differ here and there in height, so the groups don’t form a straight line. If the judge will be there early in the morning, than you know that some of your plants will not have fully openend their topends. So you change your timer settings and make the lights switch on a few hours earlier. If you think that it’s more beautiful when the topends bow a little to the frontside, than you switch of the tubes at the backside and switch them on just before the judge arrivés, and the plants will show their topends more beautiful. 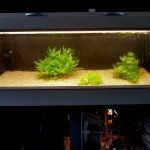 You can also use this trick to make a better picture of your tank. It happens that I have to correct the length of some plants the evening before the coming of the Judge, because a group had just grown a little too fast. All of the plants should be exactly on width and height as planned. Dead leaves on the surface should be removed, as well as old leaves on plants, or the ones covered with algaes, or discolored leaves. When the judge sits in front of your tank, that’s the moment of truth. Just those few minutes. See here the difference between before and after the maintenance. When all plants have reached the surface, they form a dense hedge that no longer shows any back wall. After the maintenance, the back wall will be visible again on different places, resulting in much more suggestion of depth. For a photo judgement this is now, or tomorrow, the moment to take a picture. For the assessment of the aquarium by the judge it is important that this optimum situation is reached at that moment that the Judge is there. During one of my talkes in the USA, someone asked me: “How long, how many days is your tank at it’s best?” I answered: “Only one day ! !” and that’s the truth. Some plants that are just beneath the surface today, will have emerged tomorrow. Formerly terraces were made by making real terraces on the bottom by building walls of stone or wood of different heights. Nowadays we use an almost flat bottom that slightly increases from front to back. We do that because we want to be more flexible. Terracing is now suggested by keeping the plant groups on different heights. This was the winning aquarium of Raymond Duindam at the AGA photo competition 2015. But that year Raymond was already Dutch champion. There are already beautiful pictures of that aquarium available. How the aquarium looks exactly at the time of the judgement, does not matter anymore. The large group of mosses on the right is very dominant and could, in my opinion, be a little smaller. I do not know a rule that requires 70% of the aquarium floor to be planted. In practice, that is usually the case. But that also applies to many Nature Scape aquariums. 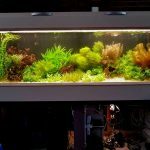 This aquarium is from Ruud van der Houven. All plant groups are healthy and very varied. But all plants are so close to each other that they form a kind of a wall and all the suggestion of depth is lost. Ruud should create so here and there some views to the back wall, as shown in the photo below. The piece of wood that he used is a bit tiny and could be a bit more robust. Below are some examples of colorful combinations of plants. Of course only a small selection from the countless possibilities that are available. We have some plants in the left or right corner, that we use as a kind of curtain and that we let grow just along the surface, contributes to the depth effect. 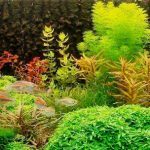 More plants are suitable for this effect, such as Potamogeton gayi, Valesneria spiralis, Egeria densa, Aponogeton crispus and also some ludwigia species. The plant must remain subtle and not become too heavy and bulky. For example, I would not use Ottelia ulvifolia or Barclaya longifolia, they become too big. 01) Limnophila aquatica, Ottelia ulvifolia, Hygrophila difformis, Miriopyllum tuberculatum, Lobelia cardinalis, Rotala macrandra en Cryptocoryne wendti bruin. 02) Limnophila indica, Bacopa caroliniana, Monosolenium tenerum, Heteranthera zosterifolia, Rotala macrandra mini, Cryptocoryne parva en Lobelia cardinalis. 03) Ludwigia inclinata verticillata var. 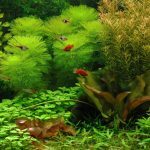 Cuba, Hygrophila difformis, Lobelia cardinalis, Nymphaea lotus “red”, Rotala macrandra mini en Cryptocoryne wendti bruin. 04) Cryptocoryne balansae, Ludwigia inclinata verticillata var. Cuba, Diplis diandra, Alternanthera reinecki minor, Anubias barteri op hout, Lobelia cardinalis en Nymphaea lotus “red”. 05) Miriopyllum tuberculatum, Bacopa caroliniana, Cryptocoryne balansae, Blyxa japonica, Staurogyne repens, Cryptocoryne wendti bruin, Diplis diandra en Alternanthera reinecki minor. 06) Aponogeton spec., Bacopa caroliniana, Blyxa japonica, Nymphaea lotus “red” en Hygrophila balsamica. 07) Rotala rotundifolia, Hemianthus micranthemoides, Ludwigia inclinata verticillata var. Cuba, Lobelia cardinalis, Echinodorus “kleiner bar” (cultivar), Pogostemon helferii en Nymphaea lotus “green”. 08) Heteranthera zosterifolia, Rotala rotundifolia, Lobelia cardinalis, Althernanthera rosaefolia. 09) Ludwigia repens, Limnophila aquatica, Rotala rotundifolia, Taxiphyllum barbieri, Lobelia cardinalis, Nymphaea micrantha, Cryptocoryne parva, Echinodorus “kleiner bar” (cultivar) en Hygrophila difformis. 10) Bacopa caroliniana, Limnophila aquatica, Samolus floribundus, Cryptocoryne wendti bruin, Hygrophila polysperma “Sri Lanka”, Ammannia gracilis en Hediotes salzmanni. 11) Taxiphyllum barbieri , Rotala macrandra, Bacopa australis, Eichhornia azureus, Hygrophila difformis, Ludwigia glandulosa en Blyxa japonica. This text is very important: ‘Use plants of different color and shape of leaves. Keep space between the plant groups.’ Too often I see plant groups that are too close to each other and that have exactly the same height. Such groups form an impenetrable dense “wall” and counteract the depth effect. Provide wholes in that wall with a views to the back wall. Make sure that the back wall is black (at least dark)so that the depth effect is further enhanced. Nowadays we often use a flat bottom that is slightly raised from the front to the rear. With or without nutrient medium. Personally, I like to use very fine gravel with a particle size of 1.5-2mm. Thoroughly cleaned before use. Then we fill the aquarium with water at the right temperature. We are not yet completely filling the aquarium to be able to work carefree in the tank. A few centimeters below the edge is enough. It is wise to have made a drawing of the composition before starting to plant. Or at least to know what you want to do. When starting we begin with a few important large striking groups. By placing these in such a way that they are not in the middle and therefore do not divide the tank into two parts, we have already ensured that the basis of the composition is allright. Provide sufficient variety in colors and leaf shapes of the plants. But do not use too many red plants. Rest is important for a good composition. Make sure to do not create a “red, green, red, green pattern”. The green plants create rest and the red plants form contrasts or strong points. I like to use large tweezers for sticking the plants in the soil. If you use newly purchased plants, remove them from the pots and separate the young plants from each other. Remove any lead. Remember that many plants were nursed above water and therefore need time to adapt. 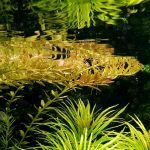 Submerged plants may change their colors and shapes. So knowledge of your plants is important. From time to time, stand at a distance from the aquarium to view the result from there. Keep in mind that the plants must be able to grow, so do not put the groups too close together. Provide several views to the back wall, but keep a large view left or right from the middle. 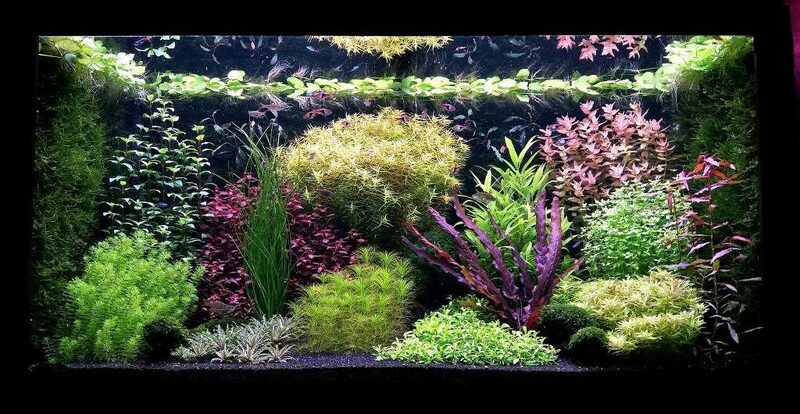 There is a rule that says: Do not use more species of plants than the frontglass of your tank consists of decimetres. 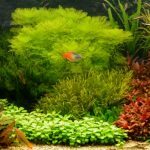 So for an aquarium of 1.60 meters, use no more than 16 species of plants. The use of more species makes your tank uneasy and the groups too small. The use of fewer species is allowed, but involves the risk of dullness. 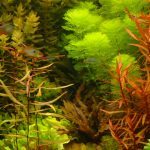 Some mosses or ferns against the backwall of your tank, just below the surface suggests depth. I do not know a rule that requires 70% of the aquarium floor to be planted. In practice, that is usually the case. (These pictures were made by Willem van Wezel, thanks). 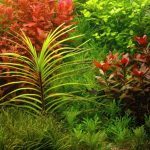 “Stem plants are often recommended for the Dutch style setup because they have fast growing rates, a wide range of leaf color and shape. 3 plant species per foot should be enough to ensure good color contrast. 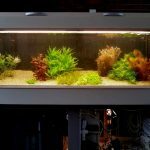 Also, due to the fact that aquarium equipment should remain hidden in the back of the tank, cork backing and moss walls are a good option in that area. Saurus cernuus and Lobelia cardinalis – low growing plants which help create the so called ‘dutch street’, a pathway set at the viewing angle, which ascends toward the back of the tank, creating the illusion of depth. Two examples of Dutch streets. Whatever species of plants you create the streets off, do not let them go from back to front in a straight line. Let them make a slight bend, preferably in line with the “viewing direction” of the tank. It is important to make the street at the front wide and narrow it backwards. The best thing is when the street disappears behind a group of other contrasting plants. 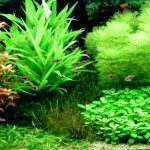 Because of this, depth and infinity are suggested The Lobelia is relatively slow growing, but the Hygrophila difformis grows much faster and needs more regular maintenance. Nowadays there is a much wider range of plants available than ten years ago. I refer to the website of a trader and nursery here in the Netherlands that I know well. You can find almost all species of available plants here. 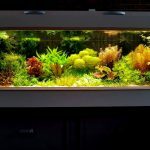 Martin van der Plas has a beautiful and interesting aquarium with a lot to see in it. He used a beautiful piece of wood (W) on which nice mosses grow. 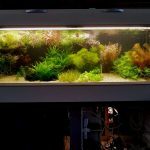 It is just a healthy and beautiful tank to look at, which provides a lot of pleasure. Aesthetic I would like to make a few remarks. (Of course Martin does not have to worry about that). The left side of the aquarium is a bit crowded due to the use of many species and small groups of plants. The three foreground groups (see the yellow lines) are all three strongly in line and parallel to the frontglass, so they do not contribute to the depth effect. The group Miriophyllum (M) and the Bacopa (B) could be exchanged, resulting in better color contrasts. Between M and B a view to the rear wall could be realized (black spot), which would also lead to more depth effects. The plant groups in the red block are also very close to each other, resulting in a rather dense “wall”. Other plants that are currently used as foreground plants and where Dutch streets can be made of are Althernanthera reinecki minor, Blyxza japonica and Hediotes salzmanni. But there are many more. 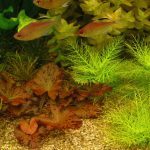 Hygrofilia corymbosa and Limnophila aquatica – large stem plants which grow fast and have a strong visual effect. 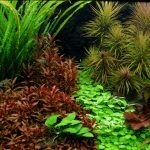 Plants of the Cryptocoryne species (lucens, lutea, walkeri, wendtii and becketii) – small aquatic plants used in the first two rows of the aquarium, they provide good contrast due to their dark earthy colors. 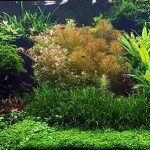 Plants used in Dutch scapes focal points for color highlights (Alternanthera reineckii, Ammania, Rotala) and size (solitary plants like Tiger Lotus or Aponogetons). 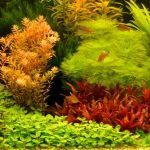 Java moss – often used between plant groups, with the purpose of creating contrast, or on pieces of hardscape, in order to create a focal point. From the point of view of the AGA, the role of the fish in the Dutch-style aquarium may seem a bit subordinate. This is because the aquariums are assessed on the basis of photos. This is quite different from how it is done in the Netherlands. Here is not judged on the basis of photos, but the judge comes to your home. He starts by assessing the first and general impression. Is the aquarium nicely integrated in the room where it is located? In terms of size and color and materials used. Then he judges if the aquarium is biologically correct. Do the fish fit together? Is there fish in the three different water levels? Then he judges if the aquarium is biologically correct. Do the fish fit together? Is there fish in the three different waterlevels? 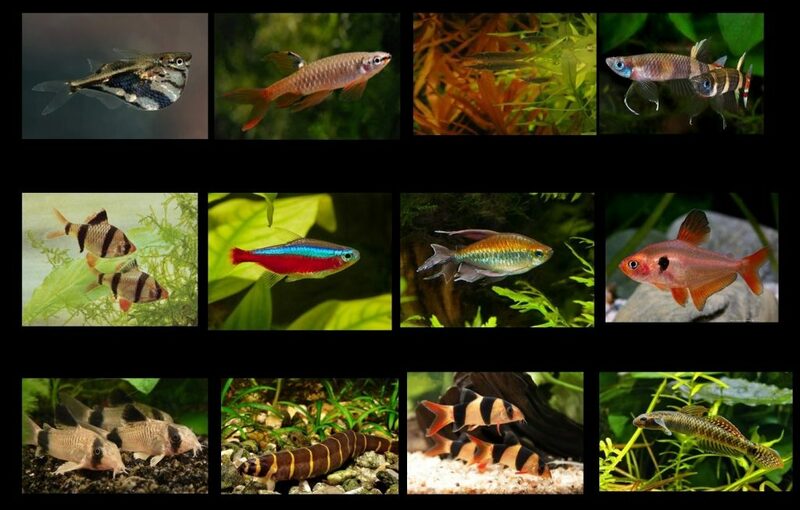 There are hundreds of species of fish available for our aquariums. You see here a few examples. The level of the row represents the level in the aquarium. My idea is that large fish make the aquarium look small (er). That’s why I prefer small species. 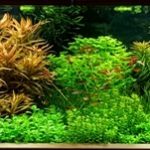 Are the plants healthy and well developed and do they fit together in terms of biotope requirements? He measures the values of the water and checks whether they fits the fish and the plants. Technical tools such as heating, pump, thermometer, pump hoses and surface cleaner must be kept out of sight as much as possible. When judging on the basis of photos, a number of the Dutch requirements mentioned above do not apply. 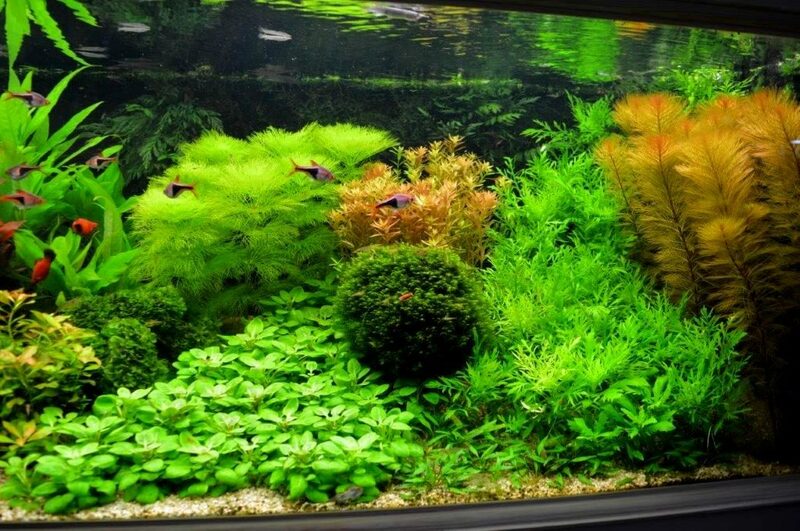 This very nice, clear and colorful tank is owned by Geert Hoogeveen. It is seen from the correct viewing angle. On the picture below you can see that the plant groups follow the lines of this viewing angle. The completely dense rear wall forms a “wall”, by making a few holes in this wall, you can look through it and a depth effect is easely achieved. By letting the lobelias disappear behind the other plant group, the effect of depth is extra strengthened. 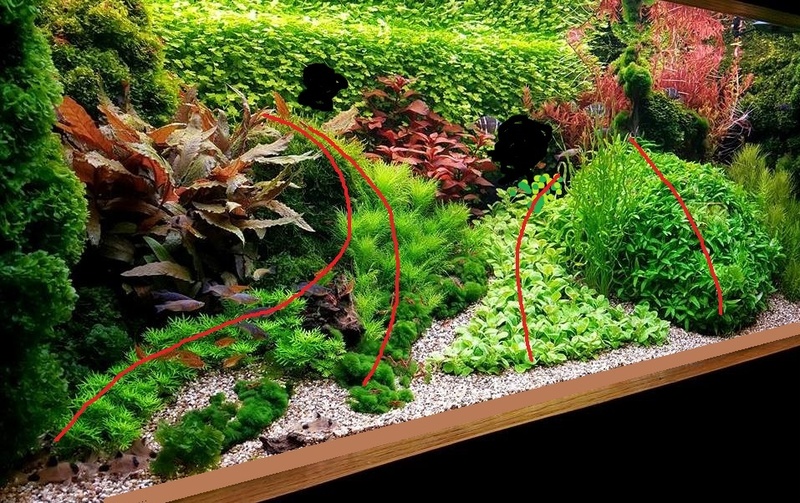 The gravel against the frontglass should always be hidden behind the aquarium list, possibly by attaching an extra strip, as here below. 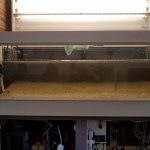 Maintaining a Dutch Syle Aquarium means quite a lot of work. At least when your tank has a big size. My tank is 3.10mtr 65cm. deep and 50cm. high. That is a large surface and means large plant groups and lots of plants. Some of my plant groups (especially foreground plants) consist of more than 500 plants per group. When I do maintenance, I have to take out a whole group, cut each plant to the right size and put it back with the tweezers.The rules of the N.B.A.T. 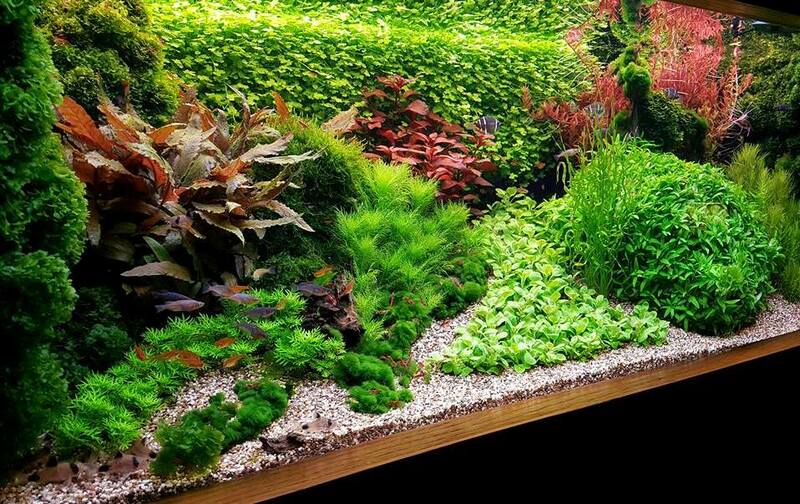 say that a Dutch Style Aquarium should not contain more than one specie of plant per 1 decimeter front glass. 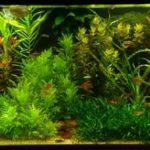 So in my tank, 3.10 mtr., I can have 31 species of plants. That means for me about 26 groups and three to five solitary plants. The spots where you should place the strikingly colored groups or the solitaires. The Dutch aquarium judgement does not only look at the aquarium itself. 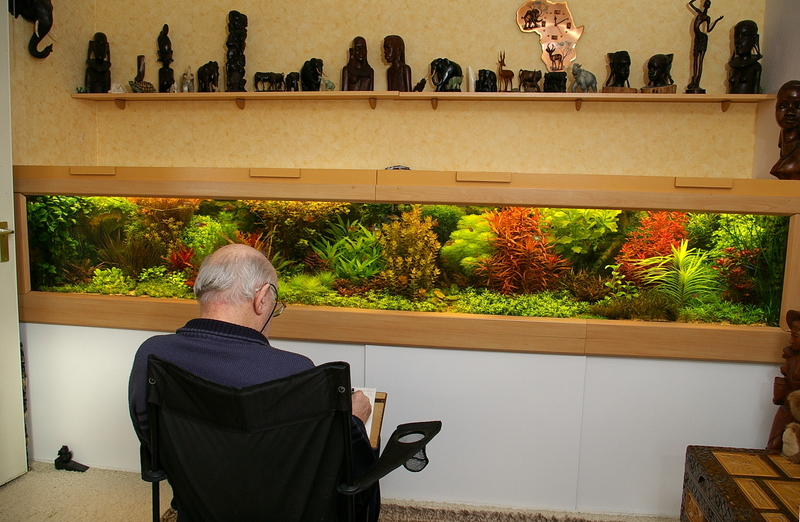 We also check whether the aquarium fits into the interior in terms of furniture and frame. Whether the color scheme is appropriate and whether the aquarium is not excessively large in relation to the volume of the room where it is located. 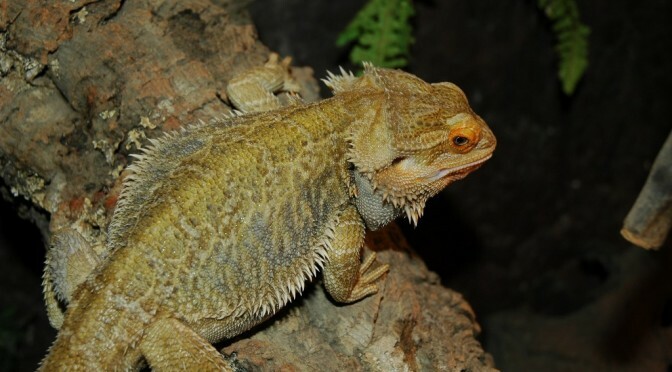 We also check whether there are objects on and around the aquarium that divert the attention from the aquarium. Yet there are also judges who are not concerned with this kind of preconditions. Jacques de Jong, designed and built his own aquarium furniture. When the aquarium is situated in the living room, there will be a place from where the aquarium is being watched. This can be from the couch or from a chair or from the dining table. That spot determines the viewing direction to the aquarium. In the case of creating Dutch streets, it is important that these streets are in line with the viewing direction. This is not important in case of a photo contest. 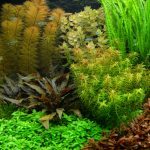 Daily Dutch aquascape maintenance includes: adding liquid fertilizer, checking tank temperature and CO² level, feeding fish and removing floating leaves and other debris. 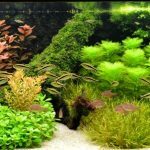 On weekly basis, the following actions are recommended: cleaning the aquarium glass, dislodging accumulated debris by hand waving around plants and substrate, cleaning the filters, pruning and replanting (if necessary). 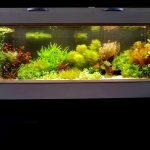 Do you have a Dutch Style aquarium with many aquarium plants? In particular, keep an eye on the CO2. 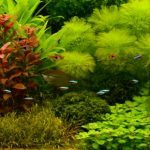 Your aquarium plants need CO2 to grow well. 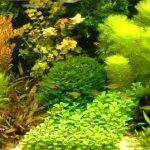 You can purchase a complete CO2 installation or opt for a cheaper and effective solution such as HS Aqua Flora Carbo. equipment setup (should be out of view). Joe Harvey won the AGA contest 2017 in the category Dutch Style. Joe Harvey won the AGA contest 2017 in the category Dutch Style. Number two was Chang Meng Chun from Taiwan and number three was my friend Scott Miller from USA. Joe has a colorful, healthy and attractive-looking aquarium. He has, in my opinion, won the match rightly. 1: Myriophyllum guyana, 2: Acmella repens, 3: Isoetes lacustris, 4:Ludwigia sp. red, 5: Didiplis diandra, 6: Pogosteman helferi ‘red’, 7: Hydrothrix gardneri, 8: Penthorum sedoides, 9: Barclaya longifolia red, 10: Hygrophila siamesis 53b, 11: Bacopa colorata, 12: Oldenlandia salzmannii, 13: Limnophila aromatica mini, 14: Persicaria sao Paulo. Wall plants: Christmas moss, Bucephalandra brownie sp, Hydrocotyle leucocephala. Hardscape: Fissidens fox on Manzinita branches. It might help to replace nr 10, Hygrophila siamesis by a broad leaf Hygrophila corymbosa. The shape of the leaves of Group 5 (Didiplis diandra) and 7 (Hydrothrix gardneri) is a little too similar. It might be an improvement to change Group 7 (Hydrothrix gardneri) and 12 (Oldenlandia salzmannii). That would also give a little more difference between Group 11 (Bacopa colorata) and 12 (Oldenlandia salzmannii). The green lines refer to plants that are very wel placed. I would prefer to replace Group 3 (Isoetes lacustris) in the crosspoint of group 1,3 and 6 (blue cross). and not so specific in front of Ludwigia sp. Red. .
Scott Miller became number three in the AGA contest Dutch Style 2017. He has a very nice tank. But his groups 5 and 11, look al lot like each other. So I would suggest to replace Group 11, Myriophyllum mattogrossense ‘Red’, by a plant wit a totally different leave, for instant Nomaphila stricta, Hygrophila guianensis or Hygrophila corymbosa. The seize of the groups at the back could be more diffrent and he should leave more space between the groups, to create more suggestion of depth. Scott Miller became number three in the AGA contest Dutch Style 2017. He has a very nice tank. His plants: 1. Vallisneria spiralis, 2. Hydrocotyle tripartite, 3. 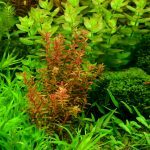 Rotala rotundifolia ‘Blood Red’, 4. Red Tiger Lotus, 5. Pogostemon erectus, 6. Staurogyne repens, 7. Blyxa japonica, 8. 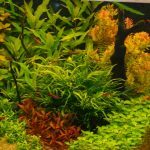 Limnophila repens, 9. Bacopa caroliniana, 10. Lobelia cardinalis ‘mini’, 11. Myriophyllum mattogrossense ‘Red’, 12. Alternanthera reineckii ‘mini’, 13. Microsorum pteropus ‘Singapore’, 14. Hygrophila corymbosa ‘Siamensis 53B’, 15. Hydrocotyle leucocephala. His groups 5 and 11, look al lot like each other. So I would suggest to replace Group 11, Myriophyllum mattogrossense ‘Red’, by a plant wit a totally different leave, for instant Nomaphila stricta, Hygrophila guianensis or Hygrophila corymbosa. The seize of the groups at the back could be more diffrent and he should leave more space between the groups, to create more suggestion of depth. 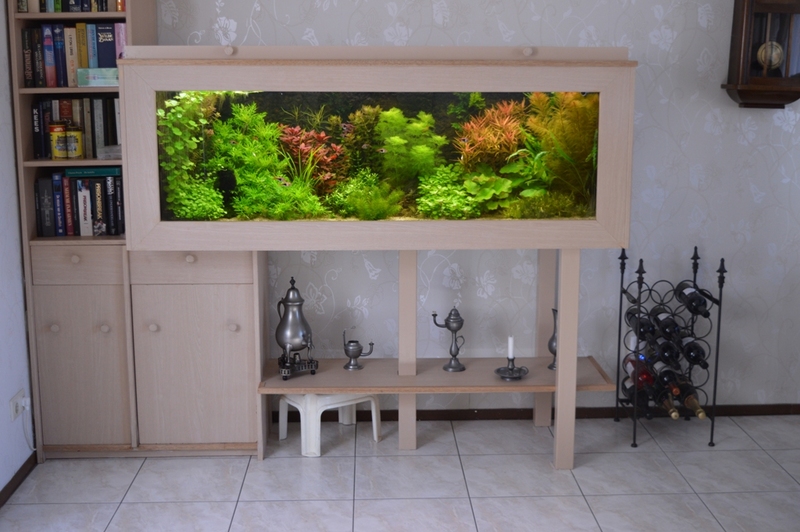 Then finally I will show you some nice examples of Dutch style aquariums. Rik Verhulst, België, 15 oktober 2016. Willem van Wezel, The Netherlands, july 2009. Jacques de Jong, The Netherlands, octobre 2011. Willem van Wezel, The Netherlands, decembre 2014. Cor de Wit, The Netherlands, november 2015. Cor de Wit, The Netherlands, january 2015. Willem van Wezel, The Netherlands, january 2017. Allwys high ranked in the regional and national competition. Cor de Wit, The Netherlands, january 2017. Gerrit Spaans, The Netherlands, regional champion 2016. Second place in the national competition. My own tank, 28 december 2017. Alain de Beer, Belgium, 2016 and 2017 Belgium national champion. J. Wiedenhoff, The Netherlands, 2016 en 2017, both years Dutch national champion. Duncan Helwich, The Netherlands, 2016. Fred van Wezel, The Netherlands, 2017. Henk Bretveld, The Netherlands 2017. Martin van der Plas, The Netherlands, 2016. Does not mean to create a Dutch style tank. He just likes lots of plants.